Blakes and Hoseasons Scottish Waterways Boating Holidays. Use the boat search facilities below to find your ideal boat. 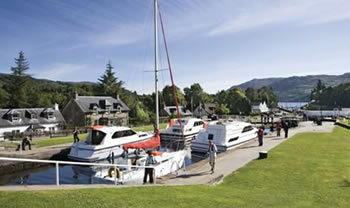 It lists every boat available for hire through Hoseasons and Blakes Boating Holidays on the Caledonian Canal, Loch Ness and the Forth & Clyde and Union Canals, together with the facility to check availability and latest prices. Narrow canals, broad open waters, stunning scenery, friendly villages and welcoming hotels. 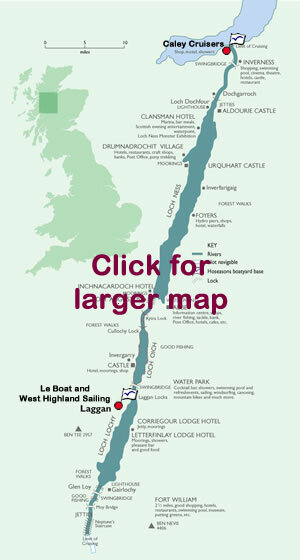 If this is what "floats your boat", then Loch Ness and the Caledonian Canal will not disappoint you. 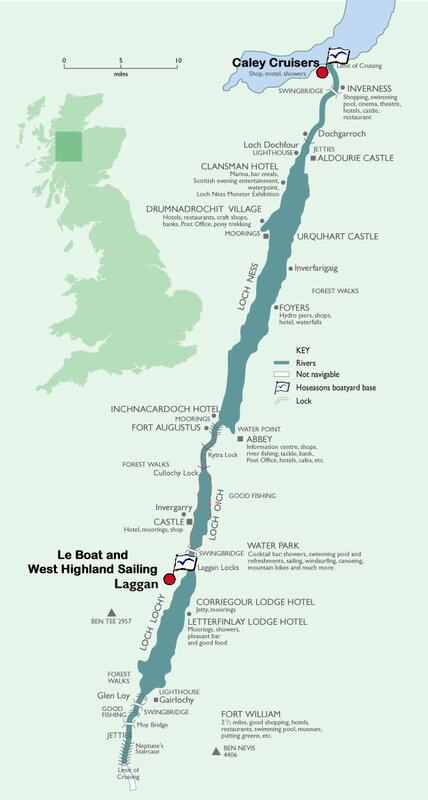 From the foothills of Ben Nevis to the town of Inverness, you will travel through the forested slopes of the Great Glen, linking the highlands most beautiful freshwater lochs, Loch Lochy, Loch Oich and of course, Loch Ness. Head south from Loch Ness to see majesty of Ben Nigh and Britain's highest mountain, Ben Nevis. What is the cruising like? The waterway is non-tidal and no previous boating experience is necessary. The ten locks are all operated by lock keepers and fees are included in your cruiser hire charge. You are never far from sheltered moorings and most piers, jetties and mooring points are free of charge. Village stores along the way are well stocked and together with the hotels you will come across en-route, boaters are extended a warm welcome. The major centres of Inverness, Fort Augustus and Fort William will afford those that want it, the possibility of a more sophisticated night out, together with big town shopping and amenities. You will be travelling through the great Scottish wilderness. Expect to see eagles, ospreys and other rare birds, together with sea otters. Visit in the period between late spring and early summer and you will experience daylight right up until 11pm. Come in the autumn to see the forests dressed in the brilliant golds, oranges and reds of Britain's own "Fall" season. Only recently restored to its former glory, the Forth & Clyde and the Union Canals allow you the opportunity to travel from one coast of Scotland to the other, experiencing stunning scenery and man made wonders along the way. Combine the beautiful countryside of lowland Scotland with the breathtaking Falkirk Wheel, the Rowan Tree, Avon and Almond aqueducts, and various tunnels and you are in for a spectacular holiday. Visit Edinburgh, Scotland's capital. Discover the imposing castle and take advantage of its overview of the city. Together with the many museums, galleries, attractions and of course Princes Street with its shopping extravaganza, Edinburgh is sure to please everyone. Cruise into Glasgow to sample life in Scotland's largest city. Here you will find galleries, exhibitions, parks and gardens together with architecture from Glasgow's Victorian past. The nightlife will not disappoint you with bars, night spots, restaurants and cinemas all vying for your attention. In the morning, shop till you drop in designer name stores, high street chains and Glasgow's market place. This city has the energy if you have the stamina to keep up with it.